Ever heard the expression “money pit”? It’s usually in reference to purchasing a chronically flawed automobile. Content marketing draws parallels. I’m going to come right out and say it: If you’ve invested in content marketing, you’ve wasted a ton of money. The majority of content doesn’t drive any traffic. Period. Even a high-traffic website like Brafton drives 68% of all search traffic from its top 100 pages. That’s right, 1.2% of all indexed pages drive 68% of all traffic. Further, 94.5% of our pages drive five clicks or less every month. As a guy who sells content marketing services for a living, did I just commit a public seppuku? First, let’s look at common problems. The company writes exclusively about topics and ideas important to the brand that are supportive of their products and services, mostly absent of topic and keyword research. This company writes on topics that are directly tied to their products and corporate belief systems. Oftentimes there is little scientific methodology to identifying what’s important to the target audience. Furthermore, blog creation is usually met with creative stifling and protracted timelines. In short, when content finally gets created, it’s unresearched, sterile and company-facing. Takeaway: There is certainly a place for maintaining consistency in messaging and keeping everyone pointed in the right direction, but it has no place in content marketing. You may be perfectly on-brand and “safe” with your content, but you’re going to be on-brand and safe all by your lonesome, because nobody wants to read your content. (Because you created it for yourself). Typically your content marketing or SEO agency will give you “keyword targets.” Usually this means they have conducted lightweight keyword research, choosing keywords with high search volumes. They suggest using these keywords in blog posts to increase the “keyword density” of your website for your targeted keywords. Takeaway: This level of keyword research is meaningless, and the theory of “keyword density” is antiquated. High-volume keywords usually correlate with high organic difficulty scores (unlikelihood of ranking anywhere meaningful) and low conversion intent (likelihood the searcher wants to buy something). Simply put, using a keyword over and over in blog posts serves only to ruin the flow of the article for the reader and does nothing for your keyword rankings. If you get a strategy like this from your vendor, send them a check dated “2010” with my regards. These folks have it almost figured out. When choosing topics to write on, strategists consider interest (monthly search volume) and the likelihood of ranking (organic difficulty scores). They likely also understand that every blog post should stand on its own and rank for the keyword being targeted. Your adept vendor will provide a content calendar of blog posts that are relevant to your audience, are thought-provoking and, most importantly, are supported by metrics that suggest your content will rank somewhere meaningful and drive sustained traffic well into the future. Takeaway: The metrics and approach are sound – your vendor is doing a “good” job. They are not doing an excellent job because they are missing a crucial step in getting content to rank. The above strategy is certain to produce occasional results, but not predictable results. Quality content is not subjective, as most people think. 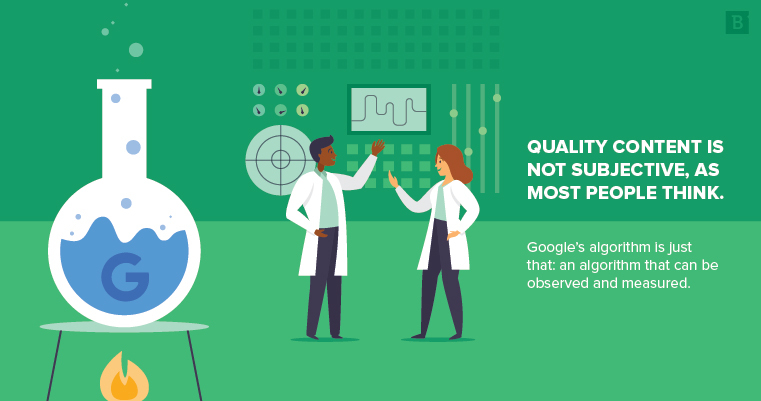 Google’s algorithm is just that: an algorithm that can be observed and measured. This is where most clients go wrong: (referring back to scenario 1, “The narcissist approach”), assuming the language their prospects use, assuming what’s important to them and assuming what quality means. What happens is that brands overemphasize their company messaging and ideals. Numbers don’t lie; check your intuition at the door. When attempting to rank for content, it’s much simpler: What does your audience care about (metrics)? How likely will you rank for a keyword (metrics)? How in-depth should your content be (metrics)? Yes, that’s a metric. When you choose a keyword you want to rank for, you will see that the top 20 existing results on Google all discuss a variety of topics in their content. Google wants to reward the website that contains the most comprehensive content for the keyword in question. Say you’ve selected a set of keywords with monthly search volume, reasonable organic difficulty scores and relevance to your brand. Now you need to know how to write about that keyword. A strategist that truly knows what he or she is doing will evaluate all the major topics discussed by the top 20 ranking websites for that keyword. The resulting list will be a blueprint for creating the most comprehensive piece of content for that keyword. This added step makes a difference. A big one. This framework will result in your brand creating the “highest quality” piece of content in the eyes of Google. Depth and breadth = quality. We are a content marketing agency. We do content every day. And we recognized that the majority of our content (scenario 3, “The Mostly Scientific Approach”) generates almost zero return. This is true for the majority of websites. Since deploying scenario 4 (“The Predictable Results Approach”), we have tripled the number of keywords ranking 1-3 in SERPs, increased impressions by 44% and multiplied clicks by 43%. This is now being replicated with clients. Have a talk with your vendor because this is the way forward.